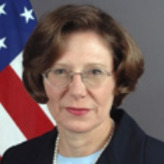 Anne E. Derse is a career member of the Senior Foreign service. Prior to her appointment as US Ambassador to Lithuania, she served as the ambassador to Azerbaijan from 2006 to 2009. She was confirmed to be the ambassador to Lithuania on July 24, 2009 and sworn in on September 28, 2009. Born in Lakewood, Ohio, Derse earned her B.A. in French and linguistics from Macalester College (St. Paul, Minnesota) in 1976, and her M.A. in international relations from Johns Hopkins University. Derse joined the State Department in 1981 as Vice Consul in Trinidad and Tobago, and then served as staff assistant to the Counselor of the Department from 1983-1984. From 1985-1988 she was a trade officer in Singapore, and then Finance and Development officer and Deputy Economic Counselor in Seoul from 1989-1993. She worked as Special Assistant for Asian Affairs from 1993-1995, and as Economic Counselor and Deputy Counselor at the U.S. Embassy in Manila from 1995-1997. Derse was also Economic Counselor at the U.S. embassy in Brussels from 1997-1999. Thereafter, she was Minister Counselor for Economic Affairs at the U.S. Mission to the European Union (1999-2003). From 2003-2004 she worked for the Department of State’s Under Secretary for Economic, Business and Agricultural Affairs as Executive Assistant. From 2004-2005, she worked as Minister Counselor for Economic Affairs in the new U.S. embassy in Baghdad.